Consensus seems pretty close to unanimous that the Marvel/Netflix partnership that brought us Daredevil, Jessica Jones, and Luke Cage has its first truly unambiguous flop with Iron Fist. Already under fire for diversity criticisms - and the show's utterly lacking response to a justifiable critique - further reviews also tag the show as boring. And while few reviewers, or viewers in general, agree with me, I think a primary driver of that dullness is that... well, all the Marvel/Netflix shows are kind of boring. But for most of them, the tone matches the character: Luke Cage, Daredevil, and Jessica Jones all fit very well in an urban crime thriller, and while we can debate whether or not the shows do the genre well (I would argue that they don't), they absolutely make tonal sense. They fit their genre, so there's a natural flow to the shows. Iron Fist, put simply, does not. 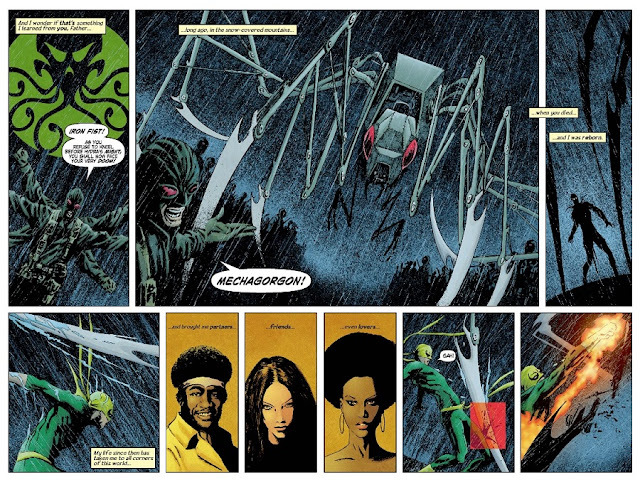 Now, when I mention that Iron Fist doesn't particularly fit in the urban crime thriller milieu, I should probably specify that most characters, Iron Fist included, can handle any genre. You can do romance with Batman, noir with Spider-Man, political drama with Wonder Woman. These characters are endlessly flexible, built to weather years of changing trends and storytelling mores. But, if you are going to mess around with the kinds of stories the character works best in, you need a solid understanding of the character to begin with. You need a strong base upon which to build. The Marvel/Netflix collaborations do have some notable strengths, but they share some important weaknesses with the films of the MCU, particularly with regards to tonal consistency. In an effort to create a coherent 'universe' of stories stretching across multiple franchises, Marvel Studios and Marvel Television have opted to give many of their stories the same basic tone and visual palette. So, Daredevil season 1 was a gritty urban crime thriller, as was Jessica Jones season 1 and Luke Cage season 1. Each had other touchstones to help flesh the storytelling out and make the story fit the particulars of each character, but they all fit fairly well into that core genre. It was reasonable to assume, then, that Iron Fist would follow suit. But there's a problem with that assumption. Daredevil had a long history in the urban crime genre, becoming an iconic hero as he descended into the street level darkness. Luke Cage was less tied to that kind of grit and more to early Marvel attempts at blaxploitation, but it wasn't a far stretch for the character, who has proven to be one of Marvel's most versatile heroes. And Jessica Jones was created by Marvel explicitly as a noir heroine, only later to be brought into the 'mainstream' Marvel universe. Look, could you turn that - a dude punching a helicopter out of the sky - into gritty crime drama? Sure. Comic book heroes are, as I said above, pretty malleable. They can do a lot of things. But they have a default mode that they want to return to, and Iron Fist's default tends to be a bit 'bigger' than the other three Defenders. 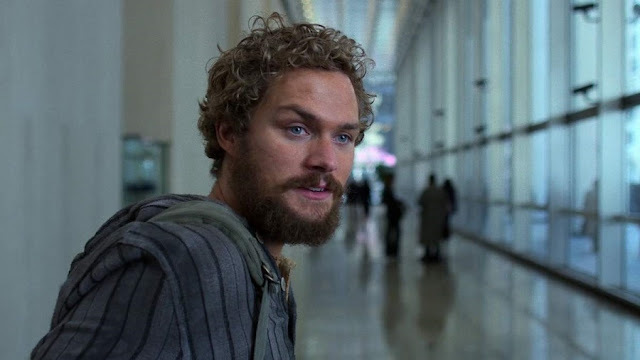 In case you are unfamiliar with the character, this is Iron Fist's backstory: He was the son of a billionaire who was lost in a plane crash in the Himalayas before wandering into another dimension. 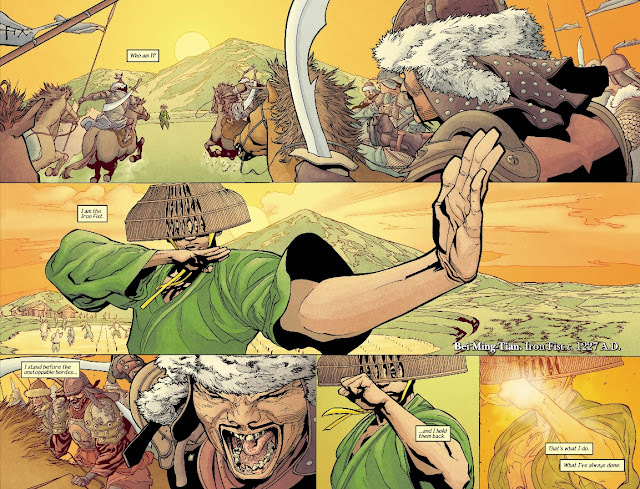 There, with no family and no resources, he was taken as an apprentice by Lei Kung the Thunderer and trained in martial arts. He eventually fought a dragon, Shou-Lao the Undying, and upon killing the dragon and plunging his fist into its heart, gained the power of the Iron Fist, one of the legendary protectors of the city of K'un-Lun, which is itself one of the Seven Capital Cities of Heaven. In other words, Iron Fist exists in a world of high pulp, a mash-up of classic martial arts movie tropes and old-school comics fantasy. This is what many of his stories gravitate towards, and while his enemies are the same ones often fought by people like Daredevil or Luke Cage, his methods are almost universally more exorbitant. 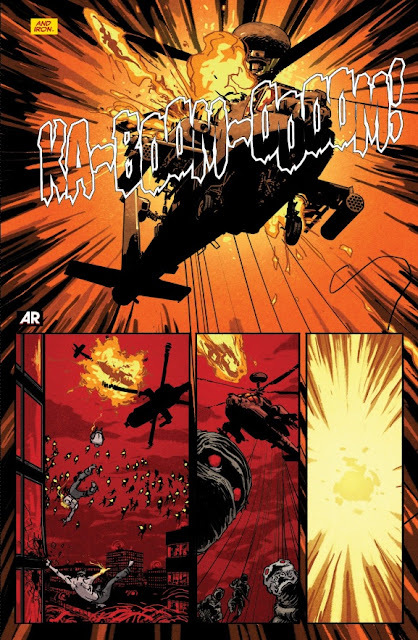 It's not that Daredevil can't be exorbitant, of course, it's just considered something of a change of pace from the world of femme fatales and crime lords that dominate the pages of his book. Danny's world leans towards the more... fantastical. As I said, though, this is a pervasive problem with Marvel and DC's most recent forays into film. Trying to make a Superman movie that looks and feels exactly like a Batman movie is, to me, a fool's errand; the same could be said for Doctor Strange and Iron Man. They take place in different worlds, and while they might share a setting - and may be available for crossovers - that shouldn't be mistaken for existing in the same kind of storytelling world. If Marvel's Netflix offerings, or the broader MCU or DCEU, are to survive and thrive, they need to be able to tell different kinds of stories with radically different 'feels' and still be able to make them understandably the same world. Audiences, after all, are not as slavishly devoted to the monotone as producers like to imagine they are. They flocked to see the satirical superhero takedown Deadpool, the blockbuster camp preposterousness of X-Men: Apocalypse, and the elegiac dystopia of Logan all within roughly a year -- all while, on TV, the genuinely surreal Legion pushed things further than I'd ever imagined. Fox has made a lot of really genuinely terrible X-Men movies, Apocalypse among them, but that's given them a willingness to experiment... and those experiments have clearly paid off for them. Because Marvel has been broadly successful, they've struggled to innovate. They have, after all, a winning formula. The reason comics universes got so big and weird and created so many lasting, indelible characters is precisely because they weren't all trying to be the same thing. It's because an Amazon from a lost island of perfect women could exist in the same world as a little boy whose parents were gunned down in an alley and no one would bat an eye. That's real life. Some of my days are romantic comedy; some are indie drama; some are travelogue. And that's just my own life. There are more experiences out there in the world than I can imagine, and our stories must reflect that diversity. Iron Fist is the first genuine failure for the Netflix/Marvel partnership to me not because it's far-and-away the worst of the shows, but because it's the first of the shows that simply doesn't understand its hero. Jessica Jones understood that one of its lead's defining conflicts was overcoming trauma, and built a show around that central idea. It understood who Jessica was and what she wanted, and it told a story meant to explore that concept in detail. Watching Iron Fist, I get the impression that the showrunner was shown Daredevil and Jessica Jones and told to just do that again. The show doesn't come from a place of understanding, or even trying to understand, who Danny is or what he wants; mostly it seems to come from a place of trying to understand who the average Netflix/Marvel viewer is and what they want. Iron Fist is, at its deepest, about reminding you to watch The Defenders.